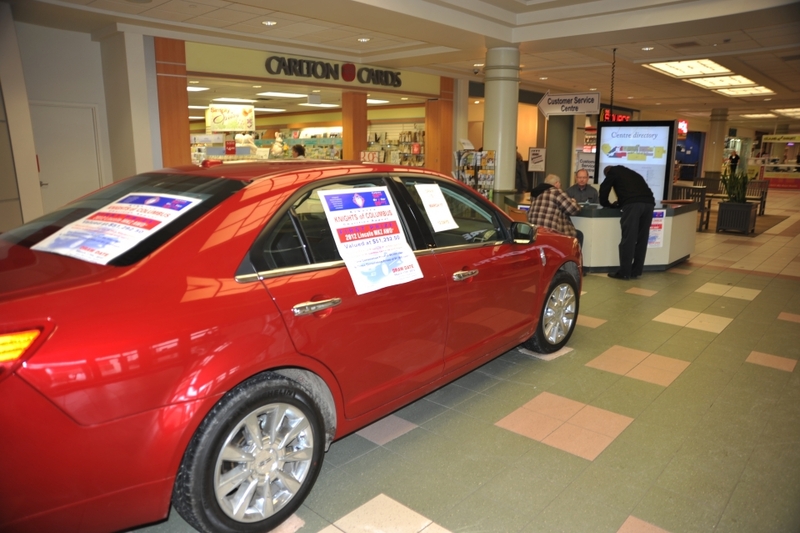 Brother Paul Liber mans the ticket booth at Bonnie Doon Mall during the hugely successful Charities Appeal campaign. CONGRATULATIONS to everyone who was involved including those who bought tickets or sold tickets. We extend our hearty appreciation to four key members of our council. Firstly to Grand Knight Al Girard who did a great job while the writer was globetrotting. Secondly, to Arnold Lorenz who organized the schedules for the malls and to Paul Liber and Ken Shivak for being the Bankers for the four weeks we were in the malls. A special thank-you to Koch Ford Lincoln for providing the attractive red Lincoln that caught the attention of many ticket purchasers. This success could only be achieved with a strong TEAM effort. Our efforts generated funds for our State Council, the Alberta Charitable Foundation and for the charities designated by our council. Next year we will strive for an even greater participation by all council members – “many hands make the job easier”. Fraternally Grateful to the Brother Knights of Father Bonner Council. I've just received a phone call from Charities Appeal Chairman, Brother Paul Froment. He told me that he's been working on the final results and has discovered that he had not credited us with all of our sales. The adjustments have been made, with the result that we set a new single-council record this year. Our total sales were $20,554. We sold two of the $1,000 winning tickets, and we beat the second-place selling council by $4710.00. I'm extremely proud of our team effort. We set the benchmark for future years. Out council will be the standard to which all other councils try to follow. and Ken Shivak as well as everyone who either sold or bought tickets.